Invalid event key. Please choose from available properties. The event strategy is created in the class that contains inherited properties only or that does not contain any properties. You can choose the event key only from the properties of the event strategy class, without the inherited properties. Therefore, each time you create a class for event strategies, you must create at least one property in that class to eliminate this error. Perform the following steps to create a property that you can select as the event key for your event strategy class. 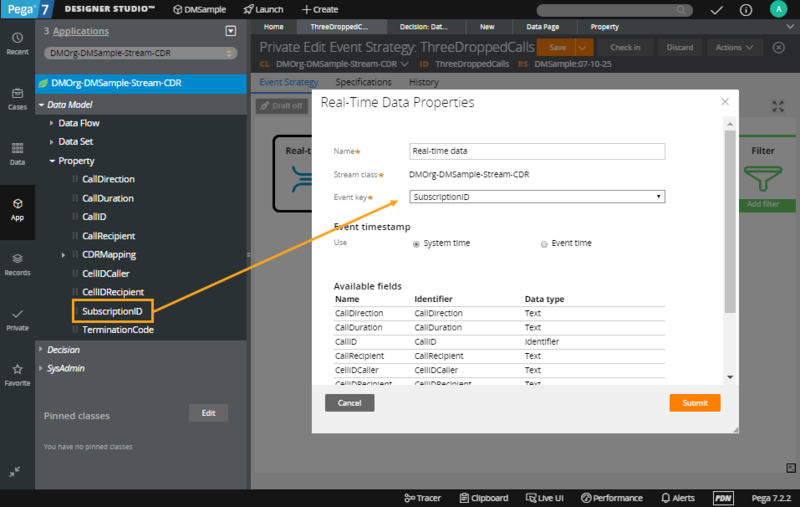 In the Applications Explorer, navigate to the data class that contains the event strategy for which you want to add a property that will be your event key. Expand the Data Model list. Right-click Property and click +Create. Specify the Label, Identifier, and the context of the property rule. Configure the Property form to define the format and type of data that is stored in the property. For more information, see Properties: Completing the Create, Save As, or Specialization form.